Watercolour, gouache, and gum arabic on vellum titled 'Renonculacées. Ficaire renonculaire. 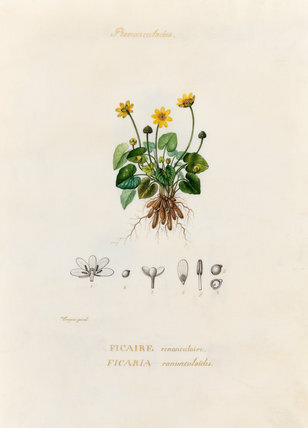 Ficaria ranunculoides', by the artist Pierre Turpin. From an album of 25 original drawings of flowers which include un-coloured dissections of the flowers and seeds beneath the main illustration.